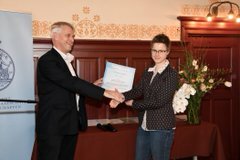 The Royal Netherlands Society of Sciences and Humanities (KHMW) has named Ellen Sterk as the winner of the AkzoNobel Graduation Prize for Chemistry and Process Technology 2018. Ellen Sterk completed her Master’s in Nanomaterials at Utrecht University, and will soon start working as a PhD candidate in the research group led by Prof. Bert Weckhuysen at the Debye Institute for Nanomaterials in Utrecht. “During her Master’s, Ellen Sterk started researching a field that we at Utrecht University hadn’t paid much attention to: the theoretical quantum chemical modelling of catalytic reactions”, according to Charlotte Vogt, her day-to-day thesis supervisor. “I had come up with a very challenging project in that area, and then I went looking for a strong student to take it on. And Ellen has exceeded all of our expectations. We’re all extremely proud of her!” Sterk focuses specifically on a reaction that reduces CO2 emissions in the atmosphere. Her research has already provided a significant contribution to a scientific publication, and according to her thesis supervisors Professor Bert Weckhuysen (UU) and Dr. Ivo Filot (TU/e), her Master’s thesis was nothing less than ‘excellent’.